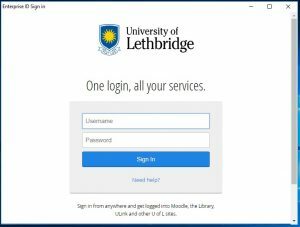 The University of Lethbridge has a license agreement with Adobe which allows us to install Adobe Creative Cloud (Adobe CC) and Adobe Document Cloud (a.k.a. Adobe Acrobat Pro or Adobe DC) on faculty, staff, and computers in our computer labs and in the library. 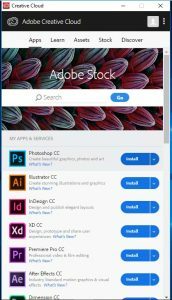 Recently, Adobe has changed the requirements for licensing this software which will require some changes to the way we install and activate this software. Read on for more details. 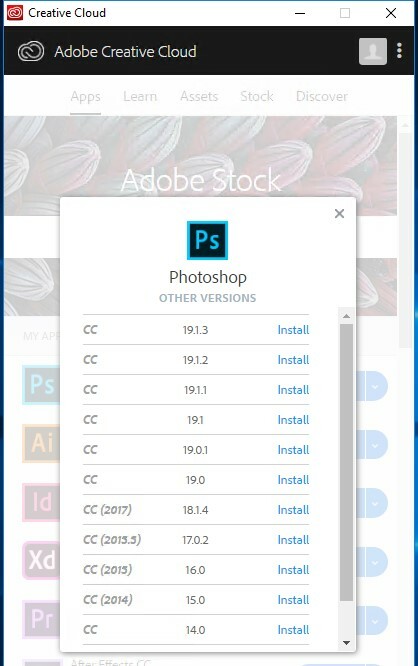 Today, our Adobe CC and Adobe DC software is licensed via serial numbers; we create installation packages based on our serial numbers and activation happens for each computer the software is installed on. 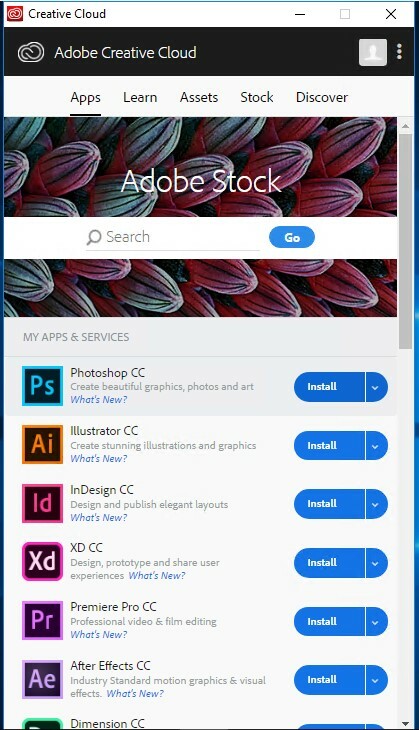 In the case of Adobe CC, if you request the full Adobe CC suite the installation package is quite large and takes a considerable amount of time to install. 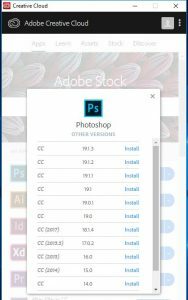 We do have a smaller version of the package available that contains a subset of the Adobe CC applications which helps improve the installation time slightly. These packages must be maintained periodically so they contain the latest versions of the software. The typical way you would obtain this software is that you would put in a request through our automated request system to have this software installed and a technician, either in person or remotely, would install the software on your computer. The technician would enter information about the computer the software was installed on into our tracking system so that we can ensure we are within the limits of our license agreement as far as total installations on campus. The software, once installed on your computer, would prompt you to install patches periodically to keep it secure and working properly, however if a new major version of any product was released these updates were not automatically applied to your computer. To get major version updates you would again have to put in a request through our automated system and a technician would remove your existing installation, and then re-install the newer package we had created which contains the latest major version releases. Along with the limitation of performing major version updates this way, having the Adobe CC and DC products deployed this way also meant that we didn’t have access to many of the Adobe Services in the cloud since it isn’t possible to make those services available to serial licensed products; you need an account in Adobe’s cloud in order to be able to access these services. Adobe has recently signalled to us that they intend to stop supporting serial-based activations of their software and are instead moving to what they called named user licensing. Whereas before we were licensing individual computers to run Adobe software, we will now assign licenses to individuals who may then have the software installed on any device they like. Everyone is allowed to have two computers authorized to run the software at any given time. Attempting to launch the software on a third computer would result in the other two computers being signed out of Adobe Creative Cloud. 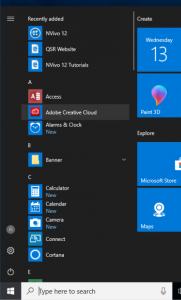 This change in licensing also gives us some new flexibility with regards to how the Adobe CC and Adobe DC products will be installed and updated on your computer: rather than installing the Adobe CC or DC suite on your computer, we will deploy a small piece of software to your computer called the Creative Cloud Desktop. The installation of this software takes only a few minutes. 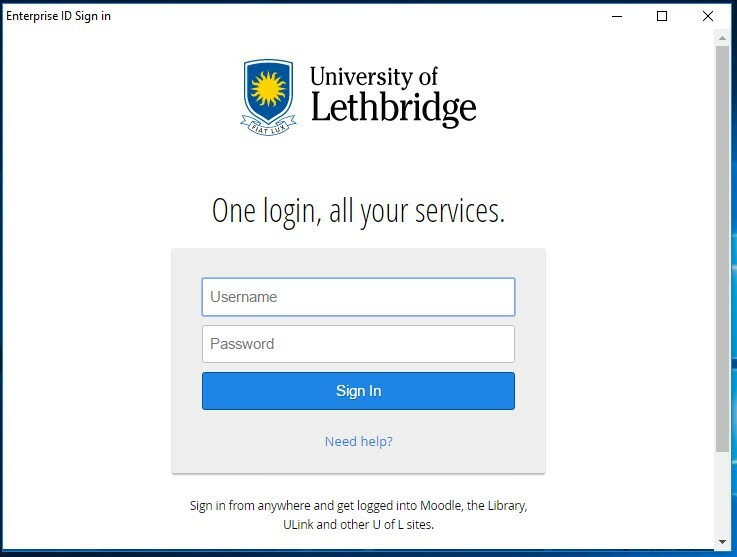 Once installed you sign in with your University of Lethbridge account and you will then be able to install any component of either suite for which we have authorized you. 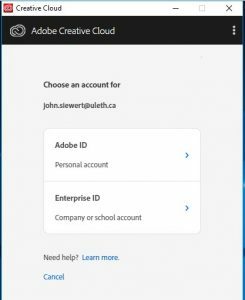 For example, if we have given you access to the full Adobe Creative Cloud suite, you will be able to install just Photoshop if that is all you need, or you can choose to install all the applications. It’s up to you. You also can choose which version of each individual application to install and whether to perform upgrades when they are released. So you may ask what will the process for requesting Adobe CC or DC software look like as a result of this change. Well, you will still put in a request through our automated request system, and indicate whether you require Adobe Creative Cloud (which includes Acrobat Pro) or if you only require Adobe Document Cloud. 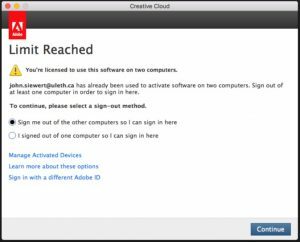 We only have a limited number of licenses Adobe CC and Adobe DC which we can assign to individuals so please only request what you need. For example, if you only need Adobe Acrobat Pro, please request Adobe DC rather than requesting Adobe CC. Also keep in mind that Windows, Mac OS, as well as most applications today have the built-in ability to view PDF files as well as the capability to create basic PDF files. Unless you are creating advanced forms or taking advantage of other advanced features which Acrobat Pro provides, you likely don’t require Adobe Acrobat Pro at all and can make of what is available to you without installing any additional software. 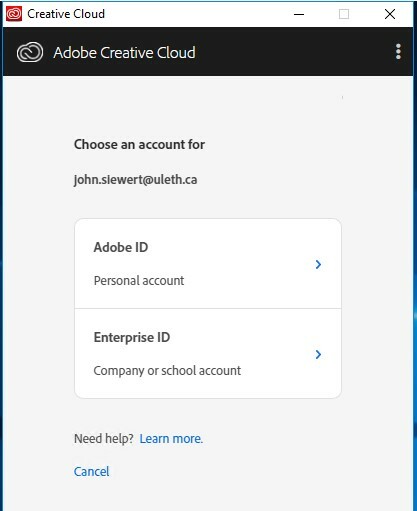 Once you have signed in successfully the Creative Cloud application will show you all the applications you are entitled to install. (Note that if you expect to be able to install something and instead of Install the button says Try it means that we need to do some checking on our end to ensure you have been given the correct permissions). Click the Install button to install any of the products you require. We mentioned earlier that you can select which versions of the software you would like to install. This is accomplished by clicking the down arrow beside the install button and then selecting Other Versions. Once installed, you access the software the same way you always have: via the Start Menu (Windows) or find them install in the Applications folder (Mac). If you have reached your two-concurrent use limit you will be warned that you must log out of the other devices in order to launch the software on this computer. 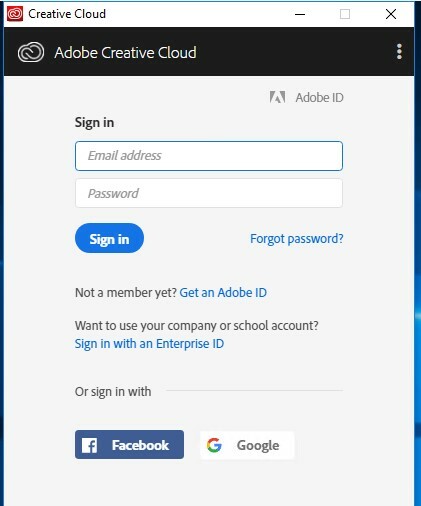 Don’t worry though, to use the software again on the other computers you simply sign-in to Adobe Creative Cloud once again. With this change in licensing comes a change in the way work-at-home licensing for Adobe CC and Adobe DC products will work. Previously, ANY UofL faculty or staff member was able to purchase a work-at-home license of Adobe CC through the IT Store at a greatly reduced rate. As we make the change to this new licensing model, ONLY faculty and staff who have had Adobe CC licenses assigned to them to use at work will be able to purchase work-at-home licenses of Adobe CC. As was stated at the onset of this article, under our license agreement we are entitled to install Adobe CC or Adobe DC on computers in our computer labs, library, and other areas where a PC may not have a single user, or even on computers where the single user of a computer may not be a faculty or staff member, as long as the computer is owned by the University of Lethbridge. If you think about named user licensing being available to faculty and staff and only accessible on no more than two devices at a time you can see that this may cause problems for these shared-computer scenarios. In these cases, Adobe will continue to allow us to use serialized installations rather than named user, however they have imposed the limitation that an update coming to the Adobe products later this summer will be the LAST version of their products to support serialized activation. Any new releases after that release will not contain the necessary support for this type of activation which version-locks any serialized installation. Adobe has committed to having a new solution to this use case by early 2019.